When traveling (flying, to be specific) for a photo or video job, there’s a lot more planning and logistics that go into being prepared for not only the job, but living out of a suitcase, sometimes without the support of people available to help you. I’ve put together a checklist of things that I often need to consider when traveling for a gig. Even though I'm currently based in Lexington, Kentucky for video production and photography, I still travel out of state for most of my work. In the last four weeks for example, I’ve had shoots in Long Beach, Las Vegas, Rhode Island, Orlando, and New Orleans, leaving from and returning to Kentucky for each one, while shooting different content on every job. Needless to say, the more I travel for video and photo jobs, the smarter and more efficient I get at planning for them. First up is a quick checklist, and further below is some commentary that goes in to detail about some of the topics they relate to. Will you have to rent gear locally? Will you have to rent gear from a rental service? 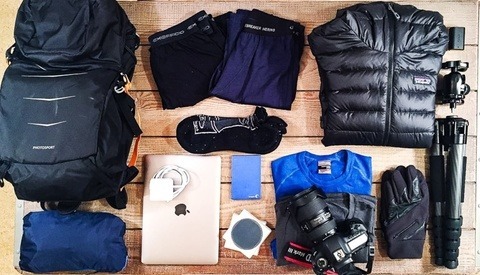 Do you have enough time to pick up and drop off your rental gear at your destination? Did you mark your rental gear for pickup at FedEx/UPS? Did you check your airlines media baggage rates/policy? Will an upgrade be cheaper than or close to the cost of checking multiple or oversize/overweight bags? Are you flying on any small, regional jets with smaller overhead bins? Did you weigh your luggage with a scale? 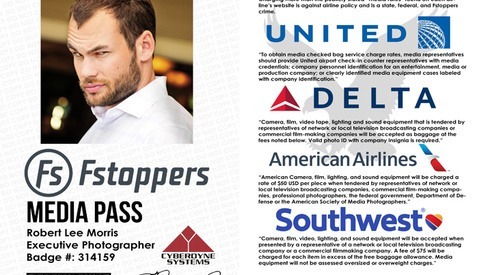 Did you print a gear manifest for TSA? Did you take photos of you bags contents? Did you tag your bags with your contact information? Do you have a hard copy of addresses, phone numbers, and itineraries for your entire trip? If you’re flying with drones, have you checked the current regulations on lithium-ion batteries? 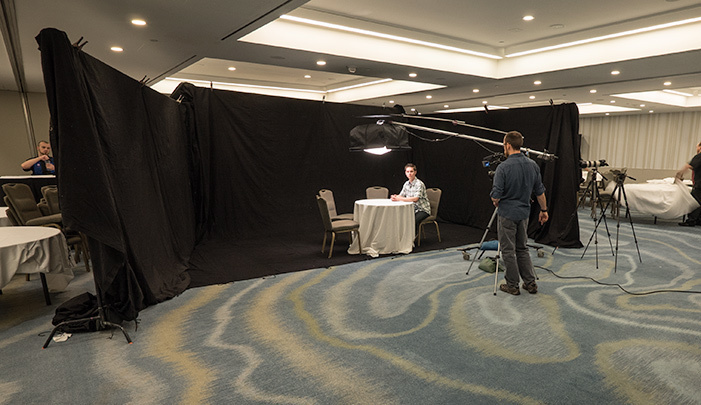 Getting C-stands, combo stands, boom arms, sandbags and more means you'll need to rent gear on location. 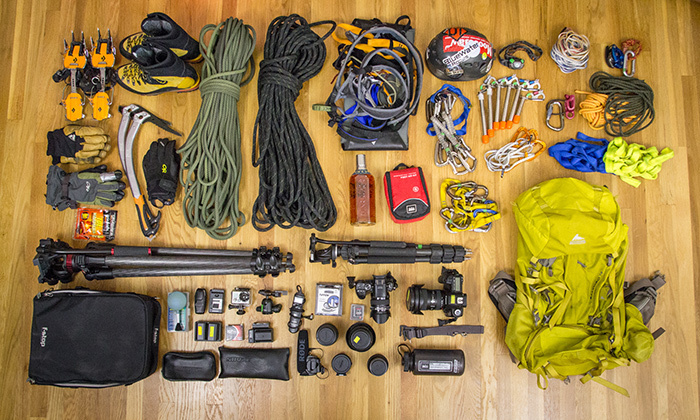 Do You Have Enough Time to Pick up Rental Gear? When traveling for a job, it’s typical to have to rent grip and lighting gear locally. You may need to extend your trip by a day, or book a very early flight in order to make it into town before the rental house closes. The same can be said for rental equipment ordered from someone like Lensrentals.com — if you’re not able to have it shipped to the place you’re staying (they typically will not ship to a hotel) or to a local crew member that you are hiring, consider marking the items to be held at the local UPS/Fedex office. In some locations they stay open late (or even all night), so you can pickup your gear the night before. Most times they will need the person who is named on the shipment to be present though, so sending a PA might not work unless you call ahead. The point here is to include enough time in your travel plans to ensure you’ll be able to get your equipment picked up, as well as dropped off, even in the event of flight delays. Sites like Kayak and Skyscanner are good ones for finding flights, with lots of sorting options to filter results. When you pick an airline, check their baggage policies as well as their media rates for bags. On certain airlines it will be worthwhile to get a media rate for bags, or even pay for an upgrade if it means getting free bags. Upgrading sometimes gives your checked bags priority status as well, which can mean having them be the first onto the baggage carousel at your final destination. 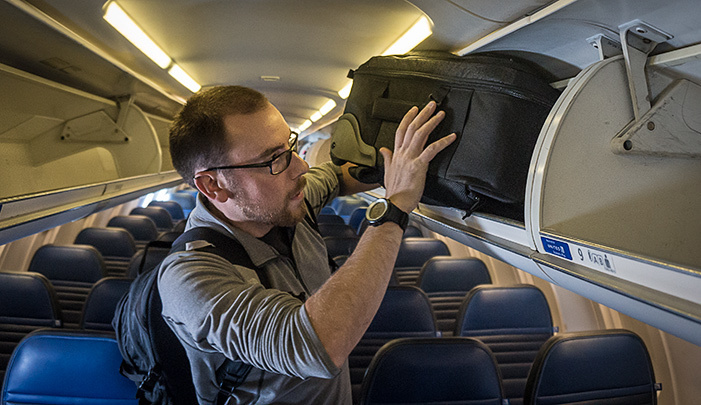 Some airlines (like Southwest, who also allows two free checked bags in their standard fare) will let media members pre-board, for that all-important overhead baggage space. Here’s a great article for more information on dealing with specific airlines and their media rates. If making connections, consider getting the early flight. That way even if you’re delayed an hour or two, you still stand a good chance at making it to your destination on the same day. Take a spare charger, a car adapter, and get your mobile loaded with travel apps. Most of us live and die by our mobile device, so keeping it powered is extremely important. I won’t include any gear lists because every job is going to be different. Instead, here are some ideas on how to pack smarter and set yourself up for the smallest chance of issues with TSA or gear loss. Get a digital luggage scale and plan to take it with you. Maximize your checked baggage to within a few pounds of the limit. In a pinch you can step on your bathroom scale with and without your luggage, but you won’t be able to do that when packing for your return. If checking a bag or hard case with gear, consider making a printed gear manifest, and including a copy with yourself, but also inside of the case. Take photos of the contents. In the event of a loss, this will help you when dealing with your insurance as well as the airline. Use luggage locks or zip ties to secure your checked bags. Contents of my Lowepro Pro Runner RL x450 AW II before traveling with it as a carry-on. 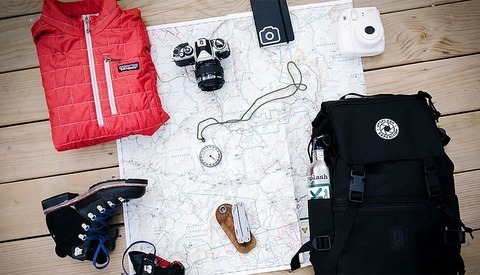 Always tag your items as well, including your phone number, email, and destination for that particular trip. 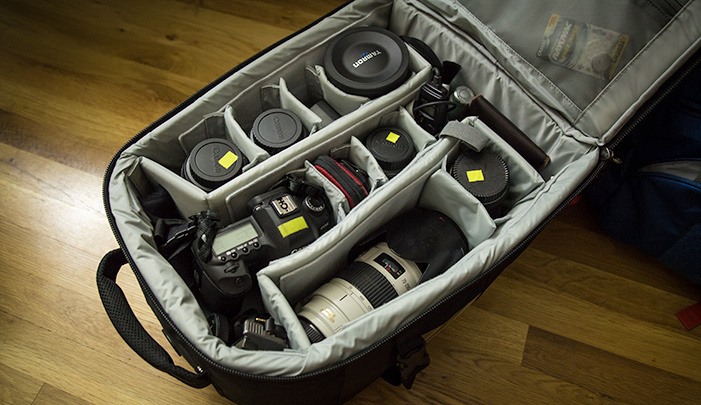 For large, checked bags of your clothes, you might be able to fit larger items like sliders, tripods, and even small light stands. Wrap them in jeans or some black cloth to keep them from getting beaten up too bad. Your camera and electronic equipment should always be carried on, so having backpacks or rollers that are made for that kind of gear will always make packing easier. 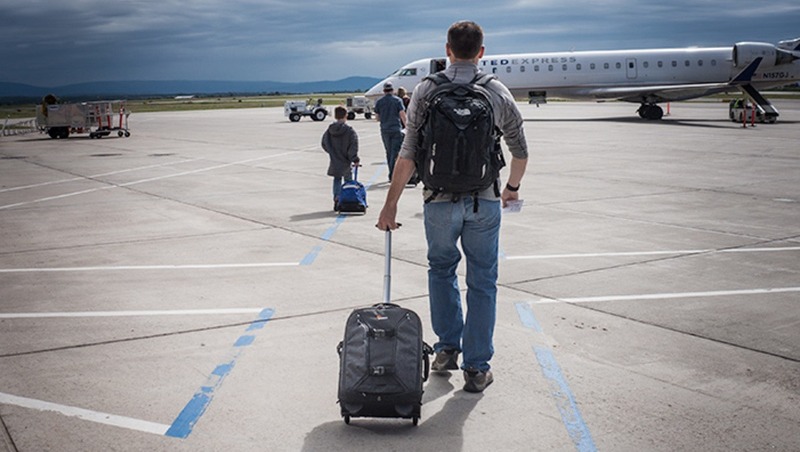 Think Tank and Lowepro are popular choices for photo roller bags, but keep in mind that if you’ll be on the move a lot with your gear at your destination, a backpack might be more convenient. 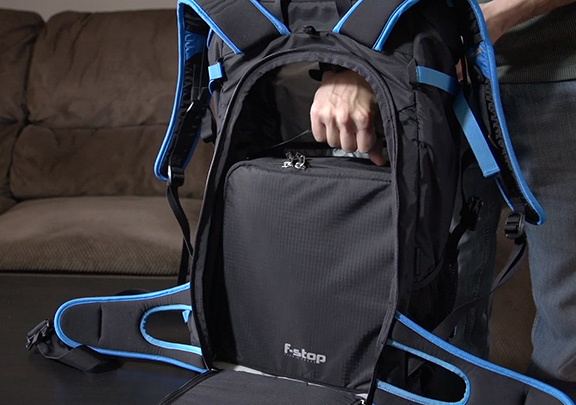 If there’s space in your checked bag, consider adding an empty backpack for you to use on location. 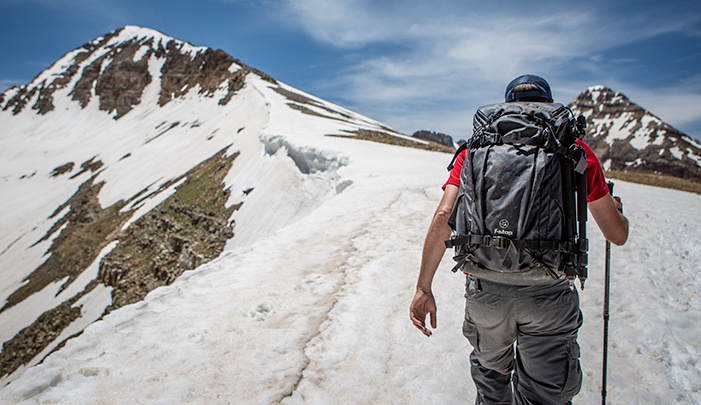 A roller bag won't do you much good in the mountains. I personally cycle between a Lowepro Pro Runner RL x450 AW II and an F-Stop Gear Ajna for my carry-on, and I use a shoulder bag made by Osprey Packs for my personal item. It’s big enough to stow my 17-inch laptop and in a pinch can handle a camera body and lenses. Pelican cases are great for full on protection of camera gear, but since I'm carrying the bag on board, I don't mind sacrificing that extra protection for more versatility. The Lowepro Pro Runner RL x450 AW II barely fits when flying on a regional jet with smaller overhead bins, like this CRJ-700. Some regional jets have small overhead spaces, and you may be asked to gate check your roller bag or backpack when it's time to board. If you think you might be flying on a regional jet, check the model of aircraft before you fly, and compare the dimensions of both the overhead and the underseat space against your desired carry on bag. Even if it will fit (my Pro Runner will indeed fit in the CRJ-900 and the CRJ-700 overhead bins) the gate agent or flight attendant still might force your to gate check it. In my experience, being polite and explaining that I had expensive camera gear — and that I was certain would fit underneath the seat in front of me — has gotten me on board, but your mileage may vary. Gate agents are looking for rollers, so try carrying it in your hand or wearing it as a backpack and you might slip by unnoticed, without a gate check tag. In the event you are forced to gate check, be prepared to remove important items like lenses, hard drives, and camera bodies and carry them on board. I haven’t heard too many stories of bags being lost when gate checking, but it’s very likely that they will be thrown around and otherwise mistreated by baggage handlers, so I'd never gate check a bag full of gear. You can be prepared by including a canvas bag, collapsible pouch, or some other easily removable insert inside of your carry-on bag, so you have something temporary to put your expensive gear in to carry on board (with F-Stop Gear bags, this would be your ICU). If your kit is inside of something like this F-Stop Gear ICU, it takes two seconds to remove it in order to avoid a gate check. Hope for the best, plan for the worst! Even when being hired to assist another producer or company on a job, try and get all of the details of where you’ll be going and staying. Knowing the hotel, and its address and phone number can be helpful in a pinch if things go wrong. Knowing flight information for other crew or talent coming in can be helpful as well. When going to a smaller-sized city, look into where the nearest camera store, Best Buy, or Radio Shack is since you never know when a piece of equipment is going to break down or when you might need a special kind of battery. Are you traveling near any major holidays? If so, check local news to make sure you won’t be late to a shoot because of a parade or major city event. If you plan to fly with a drone, including the batteries, it’s crucial to understand the rules and limits surrounding them. As of the writing of this article, the TSA will allow only two batteries, carried on only, that are above 100 watt hours (batteries that under 100 watt hours have slightly different rules). You can take an additional battery in your checked baggage, but only if it is installed in the equipment. Here’s a PDF that explains it all. This is a departure from travel tips, but something that I try to do whenever I can. If you get paid to travel and do your work, consider yourself pretty lucky — it’s something that many aspire to do, as traveling and getting to see the world is one of the most fulfilling things in life I think. To that end, whenever you have the means or the money to do so, consider extending your trips for another day or two after your shoot so that you can actually take in a location without the burden of being responsible for lugging around gear or focusing on a production. It’s harder to do when being hired to help out on someone else’s job, but I’ve been to a lot of places that I would have enjoyed being able to spend an extra day to actually be a tourist and explore that locality. Too often I’m confined to a hotel or a small handful of locations and don’t really get to enjoy the place I’m visiting. Safe travels everyone, share some of your own tips in the comments below. Two tricks that have served me well. 1 - Travel in a big jacket with decent pockets so if the check-in desk weighs your bag and asks you to remove stuff you can put lenses and camera bodies into your pockets until you get on the flight. Usually just starting to unpack into your pockets is enough for the staff to give up and wave you through. 2 - If you need to check expensive gear, place a starters pistol in your bag and declare it at the check-in desk, you don't need any sort of licence for one but the airline will be forced to security track your bag and anyone who touches it, so there's less chance of tampering or losing it. This is an old musician trick when you needed to check expensive guitars. But my biggest advice is to be aware of the sort of country you're flying to. On a recent trip to Cambodia, upon landing everybody's luggage can off the conveyor opened and with the contents strewn everywhere. Luckily I didn't have anything of value in my checked bag but I did have a decent padlock on it which meant that the baggage handlers (or whoever had gone through them) had to bust open my zips. The airline and airport accepted no responsibility for this of course and I was advised that if anything was missing I should just report it to the local police. Can anyone clarify on the drone batteries? So can I fly with my drone(dji phantom 3) with a battery installed and 2 more external batteries in my same bag? To answer your question: carry-on: yes, you could go aboard with one installed, and as many spares as you want, AS LONG AS THEY ARE UNDER 100 WATT HOURS. Checked: You may only take a single battery, and it must be installed in the drone, this applies to batteries that are both above and below 100 watt hours. Do the DJI drone batteries have to be in a special fire rated bag for carry on? And do the batteries have to be depleted or can they be fully charged? over the terminals of unpackaged batteries also helps to insulate them from short circuit. "